Camelot provides infant care services to children aged 2 to18 months. We offer full-day and half-day programmes, for infants and toddlers. 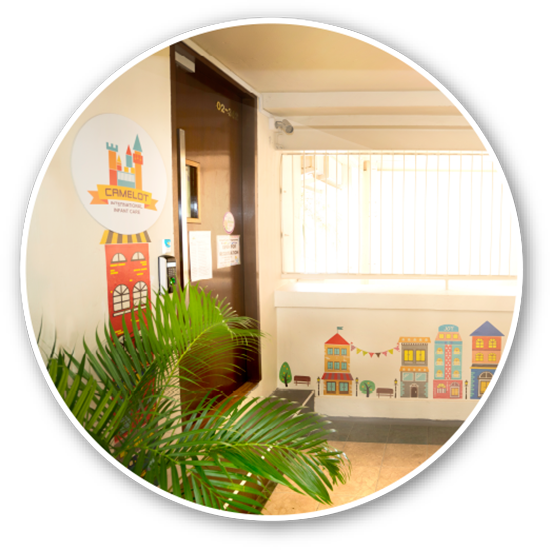 Camelot follows the International Preschool Curriculum (IPC) which strives to meet the physical, cognitive and psycho-social needs of infants and toddlers in a safe and nurturing environment. Camelot’s staff is well-trained and experienced. They are warm, passionate and caring. Drawing from the experiences of a mother’s love for her 2 boys, Camelot is created to provide a safe and nurturing haven for your precious little one! It is a set up for mothers by mothers. We offer full-day and half-day programmes, open to all children aged 2–18 months. Every child is good by nature and should be nurtured in the early years to bring out his/her best potential. Every child is unique and deserves the opportunity to learn and experience at his/her own pace. Care and education in the early years provide the springboard for a child’s future success.